From beautiful natural soft lip enhancement or adding volume and structure to the face, to subtle contouring or substantial lift, a natural more youthful look and feel is achievable with Dermal Fillers. Dermal fillers are a smooth injectable gel made from a natural complex sugar (polysaccharide) called HA. HA occurs naturally in the skin. It helps hydrate the skin by retaining water and combining with collagen and elastin to provide structure and volume. The HA in the dermal filler is not derived from animals and is manufactured and purified especially for the smoothing of wrinkles and soft lip enhancement. It is ideal for replacing the volume and elasticity lost through the process of ageing. In its natural liquid form HA is broken down and metabolized by the body quite quickly. The dermal fillers used by Skin Renu have been cross-linked, to form a gel, so they are more stable and smooth. Different “strengths” of dermal fillers are achieved by manipulating the size and no of chains that are joined together. This VYCROSS® technology means there is a range of DF to suit your particular needs. The treatment is a non-surgical procedure. Using a very fine needle the dermal filler is injected just under the skin to lift a line or wrinkle or to add volume to the lips. A local anaesthetic can used to help numb the area being treated. There is minimal discomfort with little or no downtime. This can be a lunchtime procedure, as most can return to their normal activities. Are there possible side effects with Dermal Fillers? Dermal fillers have been used for many years and are generally well tolerated. While you may experience no side effects at all, as with all medications, side effects can occur. Reported side effects are usually minimal and confined to the injection site. They include swelling, tenderness, redness, bruising, itching or discolouration. In the majority of cases these are temporary and will usually resolve themselves. We offer to all clients, at a nominal rate, the use of the Omnilux Revive red light immediately post-treatment to help minimize these possible side effects. There are a number of strengths of dermal fillers, for fine lines, medium lines and deep lines, so treatment is tailored for your needs. The product has cross-linking in the gel. Cross-linking is the substance that is added to the gel, to give the product longevity or longer lasting resistance. How long the product lasts depends on your body’s metabolism. The faster your metabolism, the faster the product will dissolve. Also your age and condition of your skin is a factor. We can estimate between 5-12 months and 18-24 months depending on the product used. 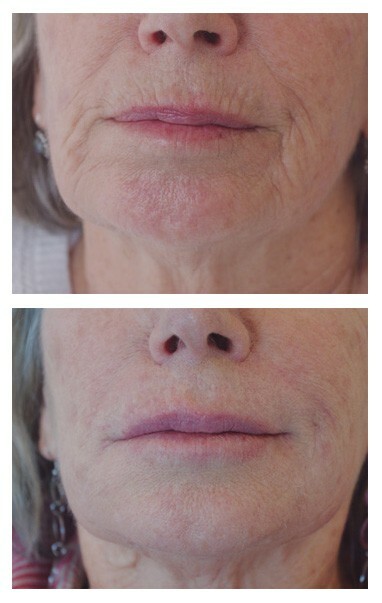 Before and after dermal fillers. A real success story and a very happy Skin Renu patient.